Informing Childers of his new title(s). 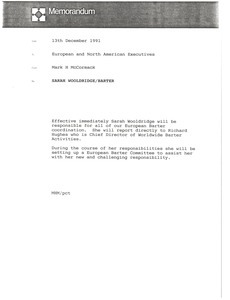 Concerning Sarah Wooldridge, who is not in charge of all European barter coordinations. 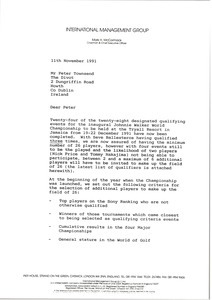 McCormack writes regarding the players for the inaugural Johnnie Walker World Championship. 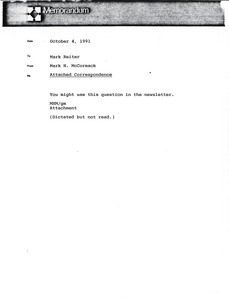 McCormack sends Mark Reiter a letter he received from Richard H. Shulman and notes that Reiter might use this question in the newsletter. 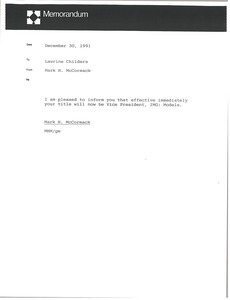 Attached letter from Shulman responds to McCormack's "Terrible Truth About Lawyers" and raises a question concerning the scheduling of commissions on a sliding scale. 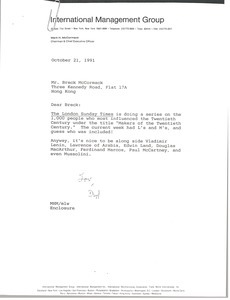 Mark McCormack sends the attached article to Breck and Leslie McCormack, a clipping from the London Sunday Times' series on the 1,000 most influential people of the Twentiel Century. "The current week had L's and M's, and guess who was included!" Enclosure not scanned. 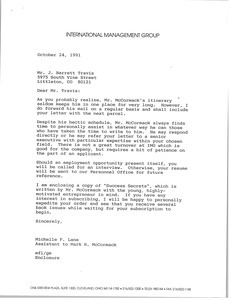 Lane responds to Travis' letter regarding employment. 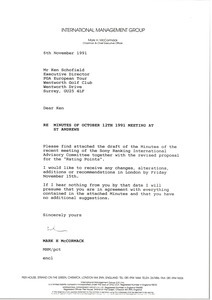 McCormack writes regarding the draft of the minutes from the Sony Ranking International Advisory Committee meeting on October 12, 1991. 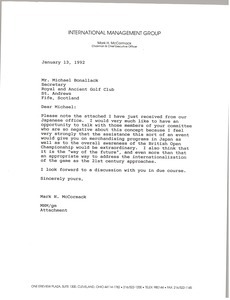 Concerning the attached memorandum, regarding Mizuno's desire to do a British Open Qualifying Tournament in Japan, McCormack would like to discuss the concept with those members of Bonallack's committee who are opposed to the idea. 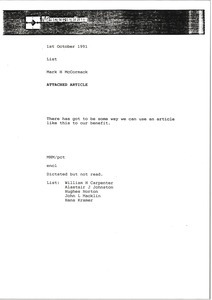 McCormack sends an article about Ladies Professional Golf Association Hall of Famer Kathy Whitworth and her lost retirement savings. Enclosure not scanned. 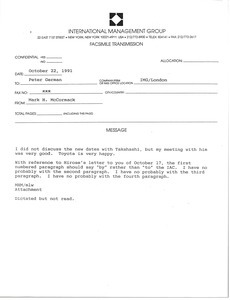 McCormack did not discuss new dates with Takahashi and comments on Hirose's letter.